The Congress on Friday cautioned people in Bihar that if the Bharatiya Janata Party-led National Democratic Alliance was voted to power in the upcoming assembly polls, its chief minister would be remote-controlled by the Centre.A day ahead of Prime Minister Narendra Modi's visit to Bihar, senior Congress leader and former union minister Jairam Ramesh targeted the BJP, saying a chief minister remote-controlled by the Centre would not be in the interest of the state. 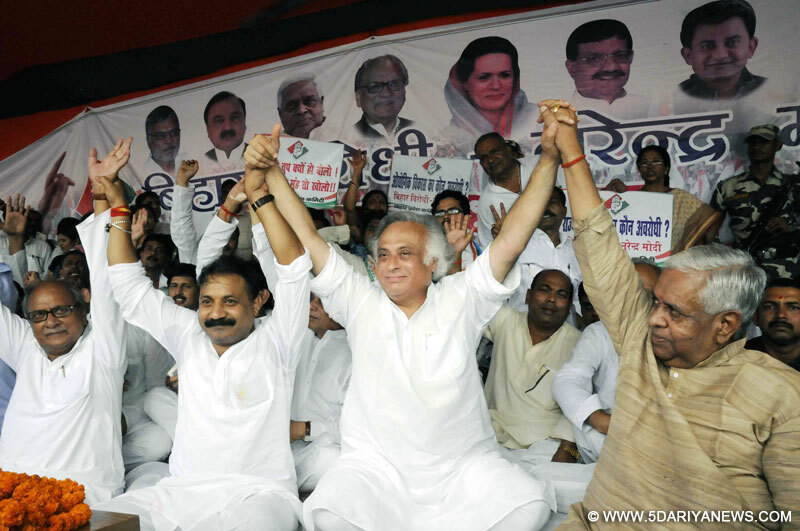 "If BJP is voted to power, real chief minister of Bihar will be the prime minister," Ramesh said here after a sit-in by the party to protest against the central government. He said the grand alliance of the Congress, Janata Dal-United (JD-U), Rashtriya Janata Dal (RJD) and National Congress Party (NCP) has already declared Nitish Kumar as its chief ministerial candidate for the assembly polls. "Nitish Kumar is a tested leader with full committment for development and governance," he added.Ramesh said it was the NDA which is yet to declare its candidate for the top post, and has announced it would contest the Bihar polls under the leadership of Modi. "BJP's face and leadership will be Modi, so real power will be also in his hands instead of the chief minister if the BJP is voted to power," he said.